PivotPoint web part allows you to create Pivot Charts and Pivot Tables, in SharePoint. It summarises long and complex lists into easily understood charts and tables, providing a live and dynamic interface with your list data, with no need to export to Excel. Pivot Charts too – bars, columns, lines areas and funnels with a range of effects and formatting options. Drill down from table cells or chart to see the list detail. So What the Heck is a Pivot Table and Why would I want one? Which of your products you have sold the most of, over time? Which of your staff is closing the most help tickets? Which day of the week to your switchboard have to deal with the most incoming calls? Which department’s staff take the least sick leave? And because Pivot Tables created using PivotPoint are directly linked to live SharePoint list data they update as the data changes, allowing you to monitor changing situations and spot trends as they emerge. 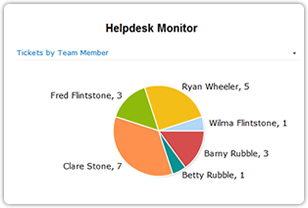 Keep track of the distribution of work within your team with an interactive dashboard showing tasks by team member and tasks by age and priority. 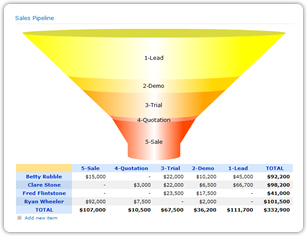 Use Pivot Point to monitor your sales pipeline. Apply PivotPoint to a sales prospects list in SharePoint to generate a dynamic sales funnel visualization and see the detail of each of your sales teams pipeline in a Pivot Table. Keep up to date with changes in the situation as the chart and table update with each change in the list data. Which versions of Microsoft SharePoint is Pentalogic Pivot Point compatible with? How do I use Pentalogic Pivot Point? Pivot Point is delivered as a SharePoint web part. Once installed on a SharePoint server you add it to a web part page and then configure it to display data from one of your Lists. Does Pivot Point need any client software of ActiveX/Java Applets installed? No - but it does need a browser that supports Adobe Flash to display the charts. What languages does Pivot Point support? Pivot Point supports all of the language packs for SharePoint that have been released by Microsoft, including those languages that use a non-Roman alphabet and require Unicode support, however the Administration interface and error messages are currently only available in in English. I already use PivotPoint v1, can I upgrade to v2? Yes you can, and any webparts you already have in place should remain unaffected. Premium Support customers can upgrade free of charge, other customers can claim a 25% discount on the list price. See Upgrading from Version 1 for full details. I already use PivotPoint v1 or v2, can I upgrade to v3? Yes you can, and any webparts you already have in place should remain unaffected. Premium Support customers can upgrade free of charge.